I recently visited the Egyptian Museum in downtown Cairo and fulfilled a lifelong dream to see firsthand Egypt’s cultural riches housed in the country’s most famous museum. 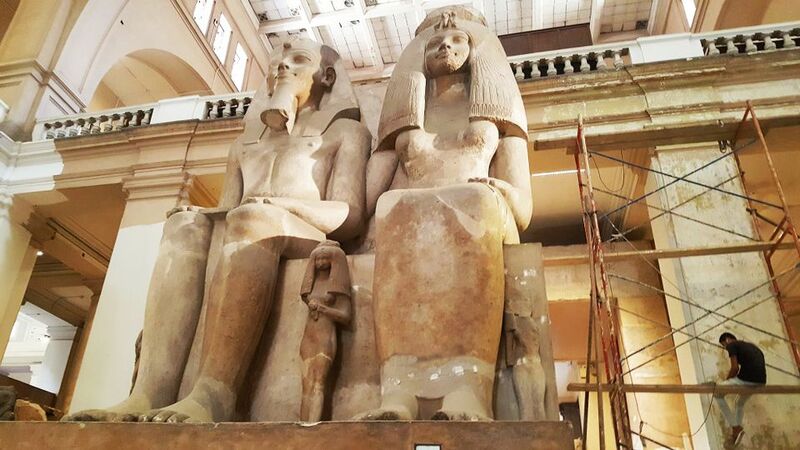 These vestiges from the past will soon be moved to the new National Museum of Egyptian Civilization in Giza. I was lucky to catch them before they were packed away and shipped to the new museum. While dated, the museum is still impressive. The eclectic two-story pink colored building was built in 1901 by the Italian architectural firm Garozzo-Zaffarani. After it was completed it was considered one of the most modern museums in the world. Today, the old courier font display cards are artifacts themselves which are typed on old typewriters when the museum first opened. At the front of the museum before you enter are the gardens. They are a temporary escape from Cairo’s hustle and bustle. In the gardens one will find large megalith statues of several of the Pharaohs, as well as a memorial to Auguste Mariette and other Egyptologists who helped find the artifacts that are housed in the museum. Once you enter, there is no leaving the awes to the end. Visitors are greeted by the colossal statues of Amenhotep III and Tiye. Around the corner is a sphinx statue of Hatshepsut (endearingly pronounced Hot-chicken-soup) and off to the side of her statue is her bed, sarcophagus and what is left of her organs, which have turned to dust. Next door to Hatshepsut is Akenaten’s famous coffin and a stone carved stele, which shows him with his wife Nefertiti and their two daughters. Finally, one will find Nefertiti’s famous bust incased in a large see through glass. Crowds typically surround it taking endless photos. The second floor of the museum follows a similar theme of ancient Egypt. There is a special exhibit on mummies and a display of mummified animals that were buried with some of the pharaohs. I personally liked the giant-sized mummified crocodiles. Finally, the best is left for last, King Tutakamns’s (King Tut’s) tomb. King Tut who ruled for a short period of time became famous because his tomb was found almost perfectly intact. Most of the other pharaonic tombs were looted over the centuries, so not much was left after archeologists rediscovered them in the late 19th and early 20th centuries. Here you will find his golden coffin, the multiple gold boxes that housed it, his gold embroidered thrown chair and of course his famous gold burial mask. The King Tut exhibit is definitely the highlight of the museum. Afterwards, patrons typically head towards the exit and leave. After I finished seeing the King Tut exhibit, I too was heading towards the door, until I saw something from the corner of my eyes. It was faces, painted on wooden coffins. I was immediately drawn to them and decided to veer from the lemmings, who were heading for the door, and walk towards the portraits. I discovered there were several hallways of these portraits. I became enamored by them. I stared at their faces for almost an hour, looking at each one carefully and studying their features. They looked real, almost as if they were photographed. Some were almost three dimensional, something that Byzantine iconography did not capture, and something that the Italian artist Giotto wouldn’t achieve until the end of the 14th century in Florence. So what were these portraits? And who were the people on these portraits? 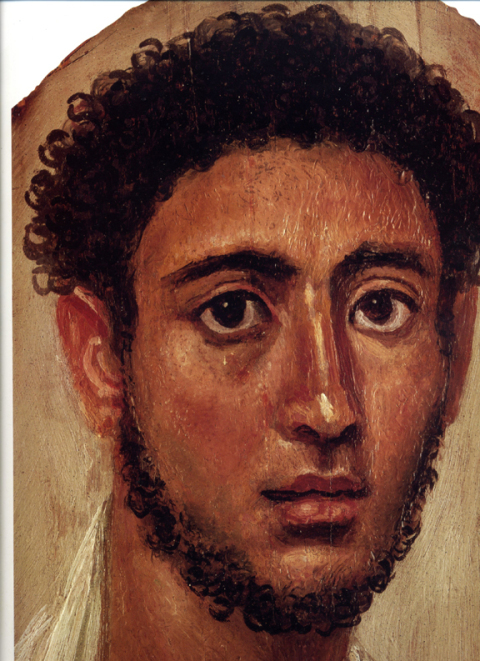 They are called the Faiyum Portraits and they have only recently been studied by art historians. The people on the portraits were from the Faiyum Basin (about 40 kilometers west of Cairo), which is where the portraits were found on coffins. 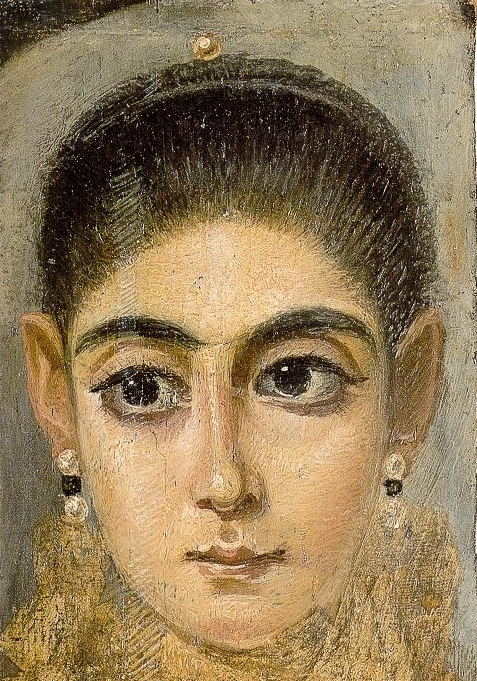 They were painted between the first and third century A.D. when Egypt was ruled by the Romans. It was custom at the time to have your burial portrait painted years before you died. 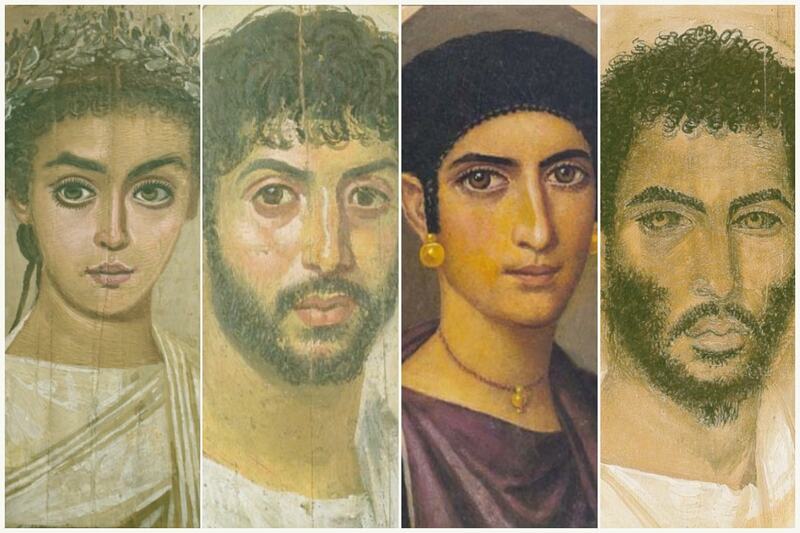 Some of the faces look Egyptian, while others look Greek and Roman. Historians believe that the Faiyum Basin was settled by Greek soldiers during Ptolemaic times. They ended up marrying local Egyptian women. During the Roman period (30 B.C.- 641 A.D.), much of the population in Faiyum was Hellenized and remained Greek-speaking. Later Roman settlers to the region also adopted a Hellenic identity. While the people of the region were seen as Egyptians, they saw themselves as Greek. The names of the people on the portraits were also Greek. There is a boy named Eutyches, a young man named Herakleides and a woman named Isidora of Ankyronpolis (modern-day El-Hiba). Marc Walton from Northwestern University and Art Institute of Chicago Center for Scientific Studies in the Arts (NU-ACCESS) believes the portraits came from the same workshop and possibly painted by the same person. For many, the Faiyum portraits show that Greek presence and influence in Egypt was far more widespread than what had previously been thought. An 1,800-year-old letter discovered in 2012 helps illustrate this Greek presence and influence in the region. A literate and homesick Aurelius Polion (Roman name) serving as a Roman legion in Pannonia (modern day Hungary) writes a letter (in Greek) to his mother who is back in Faiyum. I pray that you are in good health night and day, and I always make obeisance before all the gods on your behalf. I do not cease writing to you, but you do not have me in mind. But I do my part writing to you always and do not cease bearing you (in mind) and having you in my heart. But you never wrote to me concerning your health, how you are doing. I am worried about you because although you received letters from me often, you never wrote back to me so that I may know how you are. For many, Aurelius’ words are heartbreaking. He has not heard from his mother for some time and worries about her health. His letter shows the personal side of these portraits as well the use of Greek which was not only used as a means for communication, but as a way to express oneself. So what happened to the people of Faiyum? Historians are not quite sure, but they believe as soon as Egypt was Christianized the people of Faiyum continued to speak Greek well into the seventh and eight centuries A.D.
After the Arab invasions in 641 A.D. most converted into Islam and adopted Arabic as their language. Today museums like Egypt’s National Museum are important. While they give us a glimpse to the past they also give us a sense of what is important to a people, and how a people wants to be seen by the rest of the world. 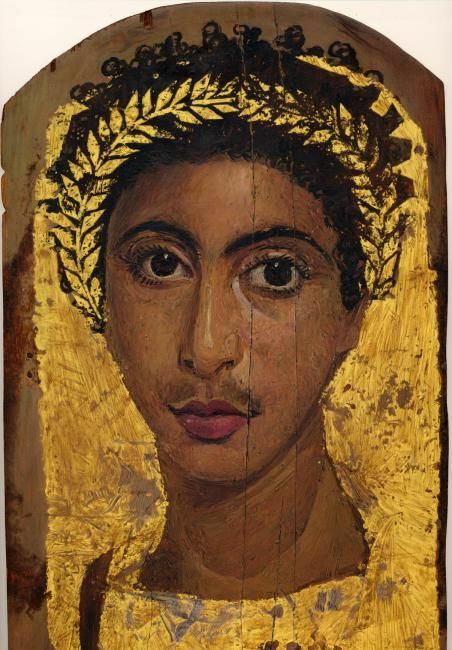 You would not know, however, that the people on the Faiyum portraits were Greek. Egypt has invested more than a billion dollars on its new museum in Giza and it is slated to open in 2020. It will be interesting to see if the Faiyum portraits will be displayed there and how they will be displayed to the rest of the world.